For many years, poet Kia Flow felt her voice was nonexistent or unheard and struggled with the desire to be something bigger. In ‘Finding my Flow,’ she takes audiences on her personal journey of growth, from Sharday to Takia to her incarnation as Kia Flow, when a regrettable mistake caused her to pick up the pen and write her way to forgiveness and a career she never thought she’d get a chance to experience. Poetry lit the path to her flow. A native of Jacksonville Fla., Kia Flow admits she’s no stranger to the game. It was poetry that lifted her veil to sharpen her perspective and allow her to reflect in depth. In 2013 Kia Flow released her mini web series “Going with the Flow” on Youtube. 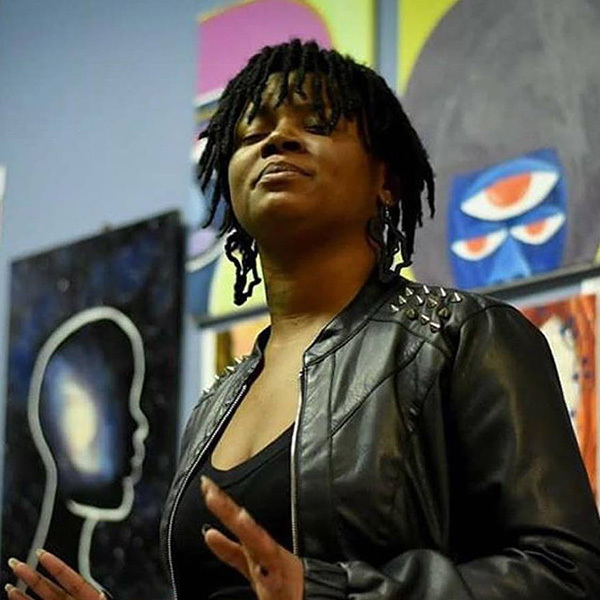 She was inducted into Black on Black Rhyme Jacksonville and she relocated to Charlotte continuing to make her name reign through the poetry community there. She was honored to be requested to perform at the Tamika Fest in 2014. She also performed for YWCA’s Stand Against Racism Rally for 2 consecutive years. Poetry competitions piqued her interest once she moved to NC. She admits that it has sharpened her performance skills and silenced much of her stage fright. Kia feels that competing in Southern Fried 2015 in Little Rock Arkansas, 2017 Louisville KY, 2018 San Antonio TX and also being the first person to represent SlamCharlotte for both WOWPS Dallas TX, and iWPS San Diego CA have been her best experiences in poetry so far. Kia also has done radio including her own show “Going with the Flow Radio Show” on Blog Talk.